My question is whether I should talk about how to make a heart for Valentines Day or Groundhog Day. I am really worried about Old Punxsutawney Phil. Most of you probably know about our German custom and whether the groundhog see his shadow. If it is cloudy when the groundhog leaves his burrow in the morning, he will leave and the winter will end. If it is sunny when he comes out, he will see his shadow. This will send him right back in signifying six more weeks of bad weather. My thought is that it is so cold, icy and snowy he won’t even be able to come out to end this horrible weather. 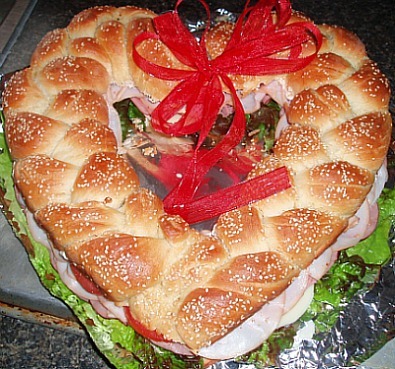 I want to tell you how to make a valentine out of bread. I have made these for years out of bread and they are always a hit. I shape the bread in a circle for birthdays and other occasions. Mix up the following recipe for a nice Valentines Day present. Add 1 teaspoon sugar to warm water; dissolve yeast in water. Scald milk and then add the ½ cup sugar, salt and shortening; cool to lukewarm. Add the yeast mixture to the milk mixture; stir in the eggs. Start adding the flour little at a time stirring to blend in. When dough in too thick to stir by hand, dump on a floured board and knead until smooth and elastic. Put dough into a greased bowl, cover and set in a warm place to rise until double in size. Punch dough down and divide into 6 parts. Roll each part into a rope 24 inches long. Use 3 ropes and make a braid; then braid the other 3 ropes. 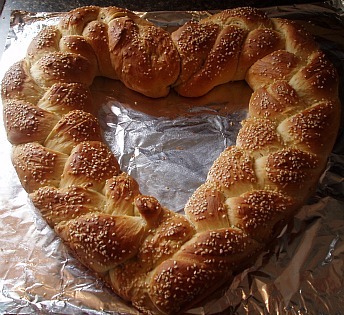 On a large pizza pan or tray, shape a heart. (Each rope will be ½ heart) Wet ends of ropes with water and work together. Let dough rise in a warm place about 1 hour. Bake until heart bread is brown about 50 minutes; set to cool. Slice horizontally and spread both sides with mayonnaise. Fill with sliced ham, sliced turkey, sliced cheese, leaf lettuce and sliced tomatoes. Wrap heart with clear plastic wrap and tie with red ribbon. You probably know how to make a heart simply by cutting a pattern out of paper or cardboard. Bake a sheet cake, when cool lay the pattern on the cake and cut around it. By placing the heart cakes in the freezer for a short while, it is easy to ice them without problems from the crumbly sides of the cakes. 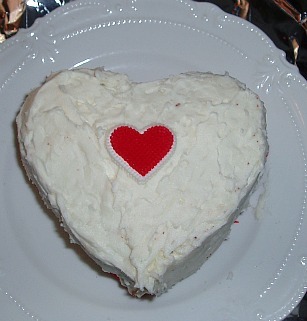 The leftover scraps of the cake after removing the hearts are very good used in many dessert recipes. The following chocolate cake recipe is the recipe that I used but you can use any even a box cake mix when you learn how to make a heart. Add chocolate, vanilla and eggs and beat until fluffy. Add the buttermilk and flour alternately to the creamed mixture, mixing until blended. Spread batter evenly into prepared pan and bake about 35 minutes or until a pick comes out clean. Let cool and cut into hearts. Frost cakes with favorite white frosting and decorate with red and pink icing. 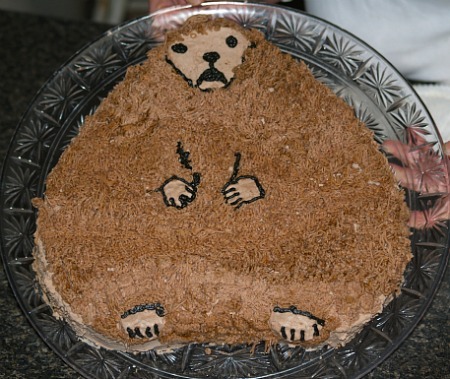 NOTE: By freezing cakes for a while makes it easier to apply frosting. I used a coconut cream cheese frosting. Melt butter; add sugar and flour and mix well. Put crust in pizza pan; bake until lightly brown and cool. Place strawberries and cornstarch in heavy saucepan and cook until thickened stirring. Add red food coloring until desired shade of red; set aside and cool. Combine cream cheese, condensed milk and lemon juice; beat well. Spread cream cheese mixture over crust; top with cooled berries and chill.